When health-conscious people start talking about food, it only takes moments before the “food industry” is marked as the culprit for our bad eating habits. Like no other, one company exemplifies where that bad reputation comes from: Ferrero. No, this is not going to be one of those diatribes where the author heralds the supposed superior qualities of Peruvian lettuce hand-picked by indigenous virgins over the offers at your local supermarket. It is about us, the consumers, sometimes cluelessly following the latest health fads. More importantly, it is about the companies exploiting our inability to educate ourselves. Over the last four years I put a lot of time into investigating what and how we eat and still I am far from understanding it in its entirety – the complexity of our nutrition mirrors the complexity of the body it sustains. It is easy to look down on people who mindlessly shovel whatever is available into them, but I can understand when someone waves the white flag when trying to understand how food works. If you are a mother of two and have a part-time job, reading the latest issue of Nature as bedside lecture when you fall over dead at 11 pm doesn’t sound like such an alluring idea. But, of course, that woman, you, me, we all still fundamentally want to be healthy and live long and prosper. We still want to make the right decisions or at least feel like we do. That is where all the “now with less fat,” “added vitamins” and “start your day healthy” slogans come in: they are meant to be our shortcuts when we make the decisions we want to feel good about. Who would buy a cereal advertised with “now making sure you will die ten years earlier”? Sometimes these slogans at least contain a grain of truth. Others twist the facts beyond recognition. One company excels at this sport like no other: Ferrero SpA. Founded in 1946 in Italy, it today in the US is mainly known for the sweet spread called “Nutella”. But worldwide Ferrero is a behemoth and consists of 38 trading companies and 18 factories with 21,500 employees. Nutella is a delicious hazelnut spread that contains quality ingredients, such as skim milk and a hint of cocoa, that moms can serve as part of a balanced breakfast. In reality, two tablespoons of Nutella (37 g) contain 200 kcal – 100 from fat, 88 from sugar – and the biggest two of the spread’s ingredients are sugar and palm oil, the world’s cheapest fat (PDF). This discrepancy just recently brought Ferrero a set of class-action lawsuits, after which the company agreed to not go on claiming that Nutella is nutritious or contains “quality ingredients”. It wasn’t their first experience with being scolded for misleading advertising. For similar reasons as now in the US, Ferrero had to retract a commercial in the UK and in Germany a high court decided that Nutella’s label was confusing. Which indeed was a particularly insidious piece of labeling creativity: Ferrero had stated the RDA of fat and sugar in Nutella as a percentage of a 15 g portion, but the amount of vitamins per 100 g. In the same table. This unusual interpretation of statistics made it look like Nutella contained only 7 and 3 percent of the RDA for fat and sugar, while two vitamins reached a whopping 30 and 70 percent. Yet the Californian woman who led the charge in filing the class-action suits was ridiculed as being “not ashamed to say [she] can’t read product labels“, that she should simply have known that “fat-laden choco-paste ain’t a health food” and women generally should be “lucky if [their] child eats breakfast at all“. Apparently these writers never had the chance to look at Ferrero’s German labels. But let me introduce you to a bit more Ferrero goodness. One of their products is most probably unknown to my US readers, but wildly popular in Europe: Kinder Chocolate, “Kinder” being German for “children”. With that name and as the product’s tag line is “for that extra serving of milk” you can imagine who the target market is, even more so than for Nutella. 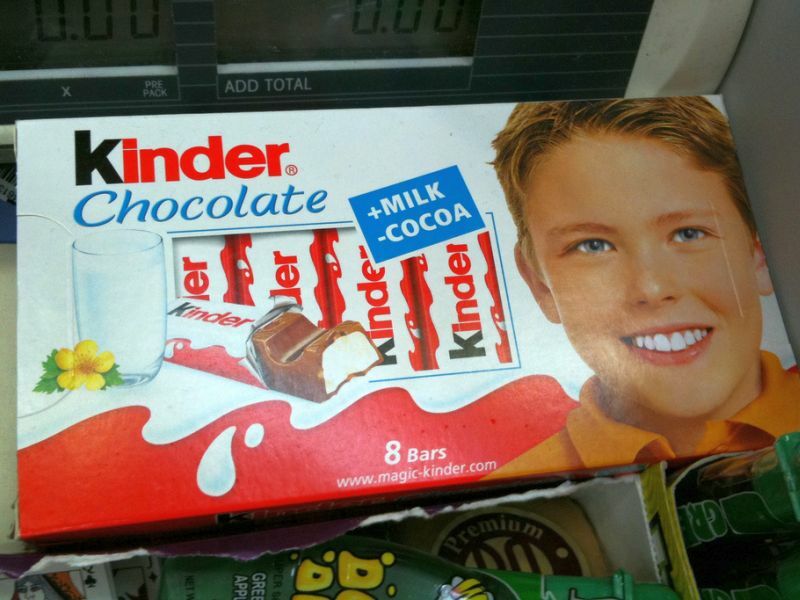 Kinder Chocolate as sold in the UK. Note the “+ milk, – cocoa” sign on the package that conveniently leaves out the fact that the No. 1 ingredient in Kinder Chocolate is sugar. I’m sure if you move as much as the woman in the commercial, you won’t have problems with Yogurette having more calories than the same amount of milk chocolate. And the list of Ferrero misbehaving could go on and on. All this in my opinion is pretty much some of the worst behavior a food company can display when marketing its products. Is it a wonder that the health crowd then takes the entire food industry as an incarnation of evil? It should be in the interest of food companies themselves to be accountable for their actions, build up consumer trust and call out those playing unfair. Otherwise good brands and companies will always suffer from the bad reputation the black sheep rightly receive. Because to the critical consumer, they already represent a unified body and all they can do now is choose what image they want that body to represent. Pictures courtesy of “Janine” and Blake Patterson. I agree with you 100%. But I think we in Germany are in a more or less good situation because really misleading ads get sometimes forbidden. In the US I think the ads are even worse and the people buy it because they think the companies telling the truth. Yes, those are interesting movies!